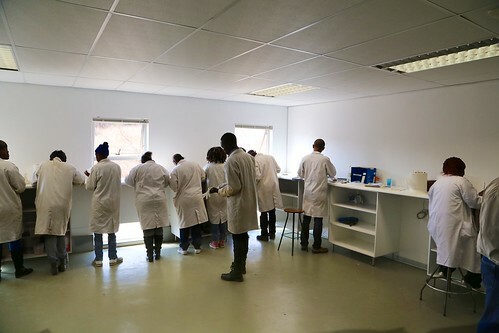 The Marapo Stones & Bones Casting Project a joint initiative of the Evolutionary Studies Institute at Wits University and the Cradle of Humankind World Heritage Site is an exciting project that is teaching members of communities living in the Cradle how to cast fossil replicas. This project is aimed at protecting, preserving and promoting the palaeo-heritage of South Africa. Unemployed youth from the area were given the opportunity to build a skills base around the heritage present in the COHWHS through an intensive six months fossil casting training programme. The project has a dedicated casting lab and members are trained as casting technicians giving them specialized and valuable skills. In addition the training included the history behind the fossils, the heritage of the area, fossil and bone identification, art classes, business and sales training, communication skills and life skills. A core principle of the programme is social and scientific development, leading to job creation for the local communities in the Cradle of Humankind World Heritage Site. Apart from teaching useful skills to individuals that could help them to support their families economically, the project also increases their understanding of the heritage of the area and the importance of its protection, says Dr Bonita de Klerk, Operations Manager for the Malapa Project at the Evolutionary Studies Institute at Wits. There is more information at the link from the University of the Witwatersrand. The work done in outreach/engagement by Bonita de Klerk has been really inspiring to watch. Those of us used to talking to journalists and public audiences as a form of outreach may not readily think of the many opportunities there are for community building and making our scientific work integral to the communities where we do our research. This is a true case of building an economic base while advancing education and integrating science across the curriculum.